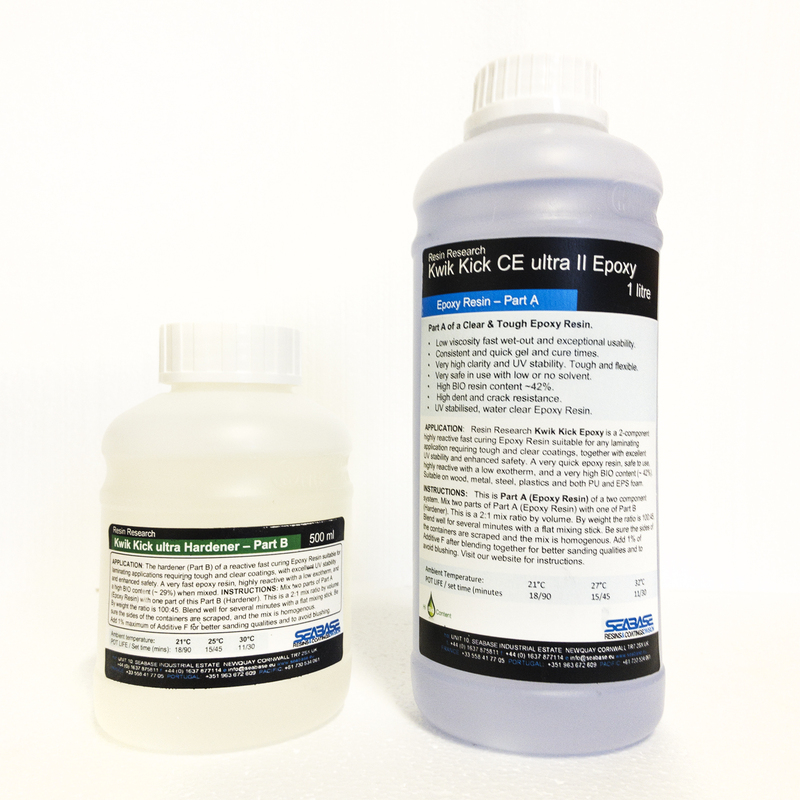 Epoxy Resin - Kwik Kick by Resin Research. Clear, stable, safe and tough! Resin Research Kwik Kick ultra Epoxy Resin and Hardener. The ultimate Epoxy Resin. 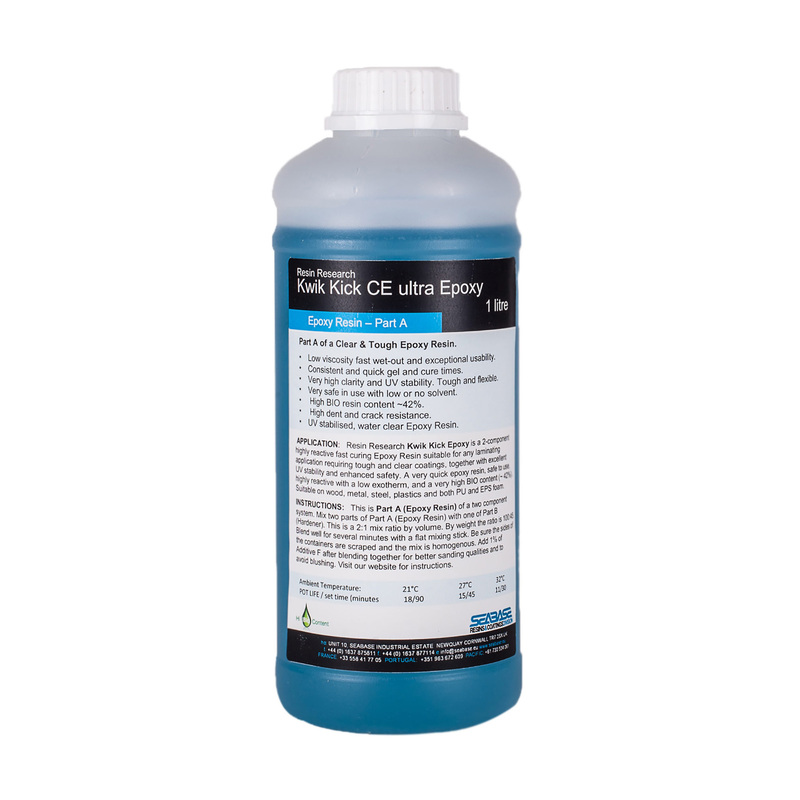 UV stable, clear (very clear), safe, quick, strong and easy to use, this is by far the best and safest epoxy resin available today. Easy 2:1 by volume mix ratio for trouble free use. Ultra clear laminates when used with the optically matched Hexcel by Seabase fibreglass. The fastest setting hand lay up epoxy resin yet. As fast or faster than polyester resins in many production scenarios. Mimics polyester resin in curing by thickening in a similar way but without the hard gel time. This system has only one speed – fast. With Ambient Temperature at 25 deg C, has a pot life of 12 mins and Set Time – Tack Free in 1.5 hrs. 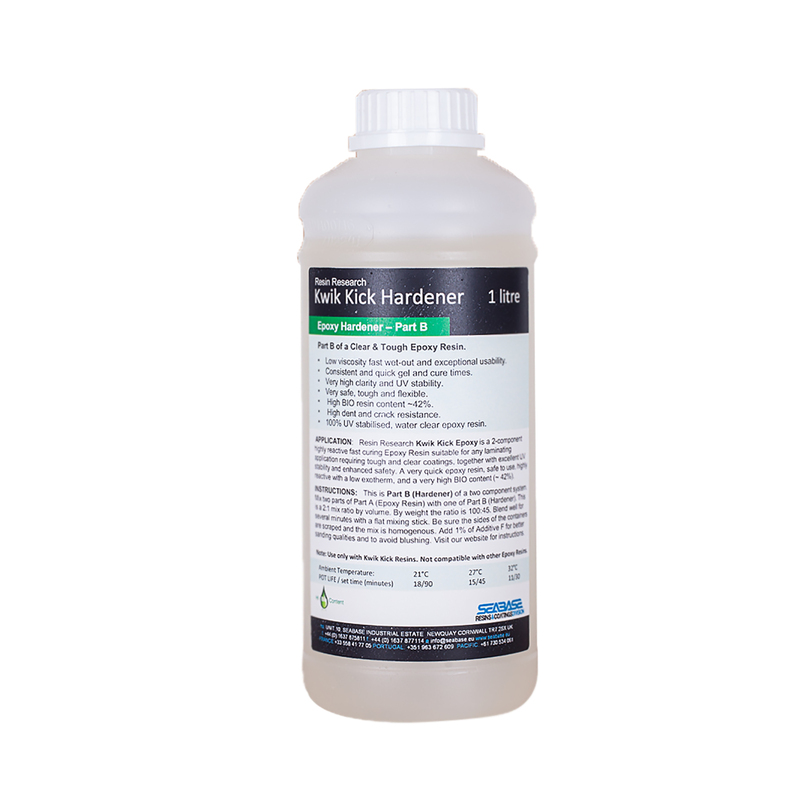 The balance of excellent colour, UV stability, varying hardener speeds, easy mix ratios, extremely low vapour pressure, excellent chemical adhesion and high gloss finish make this resin system easy to use and an effective and positive production contributor to everyone from the small craftsman to large scale producers. Note: 1 litre of Epoxy is approx 10% more than 1 kg of resin. For slower gel and cure, use Resin Research 2000CE Epoxy Resin with 2100F (fast), 2100S (slow) and 2100X (extra slow) Hardeners. The Mix Ratio Sheet is ideal for easy mix references by volume and weight. Has your Epoxy thickened or gone cloudy? See why here…..
Another ultra resin from Seabase Resins & Coatings Division.